TruTech Tools and Fluke proudly introduce the Fluke TiS an entry-level thermal imager for quick, easy, and accurate problem identification and troubleshooting designed specifically for the building inspection professional. Fluke quality, durability, and performance are available in a thermal imager engineered for the value-conscious building professional, colleges and universities. 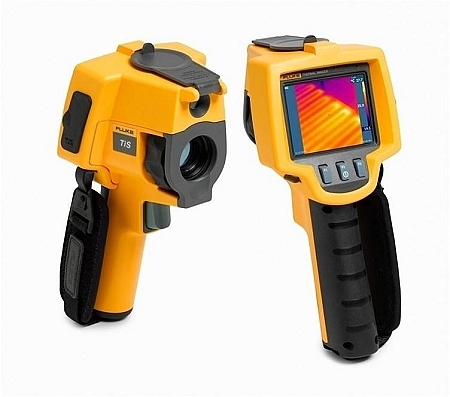 The Fluke TiS Thermal Imaging Scanner, for building diagnostics, is the most affordable thermal imaging camera that meets the proposed RESNET infrared inspection standard. If you are considering a lower priced camera; beware! DETECTOR SIZE: A Fluke TiS has a 120×120 detector or 14,400 IR pixels while other brands with an 80×80 detector only have 6,400 IR pixels. The Fluke gives you 2.25X the pixels! SCREEN SIZE: A Fluke TiS has, 3.7” 640×480 Display while other brands have a 2.8” 320×240 Display. The FLUKE TiS screen is more than 30% larger with 4x resolution! 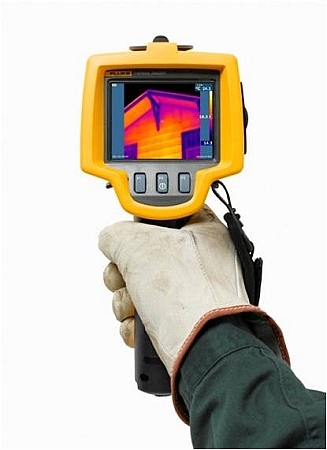 Whether you are a building inspector, home inspector, electrician, energy auditor, HVAC installer, insulator, or window installer or instructor, the Fluke Thermal Imaging Camera is the perfect tool to help you identify hidden building construction issues, find moisture intrusion, detect energy loss/missing insulation, and many basic electrical connection and load problems while providing years of trouble free service. Getting ready for HomeStar? The Fluke TiS – ’tis the camera for you! Perfect for budget conscious training programs offered through colleges, community colleges and union halls. • Largest display size (3.7”) in price class. 30% larger than comparable imagers! Applications- A tool for all seasons and trades. Property and facility management: Protect investments and increase bottom-line profits. Detect damaged or missing insulation, ineffective window and door seals, etc. Energy audits and weatherization: Identify air flow, both in and out of a building that when fixed will reduce energy usage. Access to government stimulus funds by adding thermal imaging scans to your services and build your business. Building inspectors: Inspect the integrity of a house or commercial building to protect the owner, potential owner and mortgage company’s investment. Detect damaged or missing insulation, ineffective window and door seals, or defective construction techniques and materials, etc. Roofing professionals: Extend the life of roofs by detecting areas where repairs are needed. Restoration and remediation: Detect moisture intrusion in walls, floors and ceilings and resulting mold, if any. After repairs are completed a second inspection is needed to prove the areas are dry/problem free so insurance companies can pay claims and contractors. Ok, you read through all of this and really want to know what happened to the white gloved hand in the third image of the email we sent. That hand is now on the phone calling TruTech to order a second imager, as the first one far surpassed the value for the price paid! Just found your blog and am pleased to see that is is open for comment. Not all sales company blogs are like that. Congratulations on it and for using one of Chris Pearson’s WP themes. We think his “Thesis Theme” is the best on the web, too. It’s also almost ironic that we just published the news story on the new TiS from you and Fluke today! And then found your blog. Hi, you’ve got a really informative blog here, and the Fluke is a great solution for energy auditing startups. We do audits in Connecticut, and let me tell you, few states need them more than this one. There are many old houses here, and winters are really harsh – the amount of waste and heat loss that occurs as a result is truly astounding. We’re doing our best to help people weatherize their homes, and publicize the problem.